"Power dressing" may soon have a very different and literal meaning. Scientists in the US have developed novel brush-like fibres that generate electrical energy from movement. Weaving them into a material could allow designers to create "smart" clothes which harness body movement to power portable electronic gadgets. Writing in the journal Nature, the team say that the materials could also be used in tents or other structures to harness wind energy. "Our goal is to make self-powered nanotechnology," Professor Zhong Lin Wang of the Georgia Institute of Technology and one of the authors of the paper told BBC News. "Airflows, vibrations - all these are mechanical energy that we can harvest to power devices." Dr Dianne Jones, technical director of textile electronics firm Fibretronic, said that as the market for wearable electronics expands, technologies such as the nanofibres would become increasingly attractive. "Any new power source which could provide a more integrated and soft solution in place of conventional hard battery technology would be very attractive for clothing or other electronic textile-based applications," she said. "It could perhaps be used to power tiny medical devices like a true cochlear implant or heart pacemaker, or a delivery mechanism for subcutaneous drug delivery implants or antibiotic drug reservoirs for preventing infection in retinal implants," she said. The nano-generators, as the technology is known, consist of pairs of fibres that look similar to tiny, bendable bottle-brushes. At the core of each fibre is a Kevlar stalk. "On the surface we grow crystals called nanowires," said Professor Wang. Each tiny wire is 30-50 nanometres (billionths of a metre) in length and is made of zinc oxide. They are grown in solution. "The growth is so spectacular that on the surface of the fibre all these nanowires stick out radially," he said. "And you can grow these on any substrate - hair or whatever you have." One of the bristled fibres is also dipped in gold to act as an electrode. When the pair is scrubbed together they create a small amount of electrical energy. "The fibre has a piezoelectric effect," said Professor Wang. "This is an important effect that converts mechanical energy to electricity." Experiments with the prototypes showed that two 1cm-long fibres could generate a current of four nanoamperes and an output voltage of about four millivolts. "If we can optimise the design we can get up to 80 milliwatts per square metre of fabric - that could potentially power an iPod." However, Professor George Stylios of Heriot Watt University, who works on smart flexible materials, said he believed it may be tricky to generate "meaningful" amounts of energy from clothing using the fibres. "I think it will be very difficult to generate an output useful enough to power up devices," he said. In particular, he believes anybody wearing the fibres would have to move very fast and would have to wear a lot of fabric. "You may be able to use the fibres for other applications such as changing the structure or colour of materials," he said. The fibres are the latest development in the field of "energy harvesting" which seeks to develop methods to recover otherwise-wasted energy and convert it into useful electrical energy. Everyday examples include wind-up radios and self-winding watches. The US defence research agency Darpa also has a project to tap energy from generators implanted in soldier's boots. 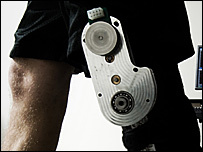 And earlier this year, scientists in Canada showed off a knee brace that would work as a dynamo. Professor Wang and his team are aiming to develop devices that could be incorporated into everyday fabrics and materials. He has already presented a nano-generator attached to a rigid surface that could be used to power sensors on vehicles. The new fibres, he believes, could be used in smart fabrics. These could be useful to the military as well as gadget lovers. "The ability to generate power for personal electronics using the clothing we wear would be a breakthrough in smart and interactive garments," said Dr Jones. Her company - Fibretronic - make textile switches and keypads for clothing that allow users to control mp3 players in their pockets. She said, there were several challenges to overcome before the nano-generator technology could be used commercially such as developing effective storage for the electricity to ensure a consistent supply. Cost and ease of manufacture would also be important, she said, but believes the research shows promise. "The possibility of developing piezoelectric, or energy generating fibres or fabrics has been something that the smart fabrics research community has been speculating about for some time," she said. "[This work] may have brought the concept one step closer to realisation."